I got to experience a little silicon joy today. (No, not that kind.) 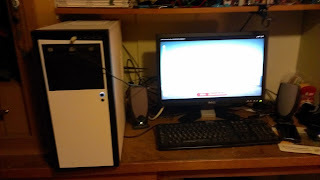 My son's computer finally is up and running only 3 weeks after we initially started working on it. But I'm getting ahead of myself, so let's backup a bit. About six months ago Ben decided he wanted to build his own gaming computer. One of his friends had built his own and among the gaming community, it's the thing to do. You can build a much better machine for the money than you can buy out of the box. Now I'll be honest, my first reaction was why? Why go through the pain and agony when you could buy one pre-built and get all the guarantees that come with it. If you build it and it doesn't work, you're left to figure it out yourself. These are not very happy thoughts coming from someone who considers himself technically capable. After talking to a couple of friends, they convinced me that it was fairly easy and would be a great project to take on with my son. I liked that idea a lot. A few years back I tried to get Ben into model building, so helped him start out on a plastic model car. Half an hour into it he was so concerned about the vapors from the glue causing cancer, that I put the thing away and it's still half-started in my basement. I used to LOVE building models, but evidently as hobbies go, it's passe'. It would probably be equivalent to my dad trying to get me interested in shooting marbles. I agreed to help him build the computer. He scraped and saved for 6 months, including mowing lawns, allowance and birthday money. He researched the parts he wanted and ordered all of them. They came in 3 boxes and after both of us watching tutorial videos, we set to work on the dining room table. As we worked, we both were fairly nerve wracked. We didn't want to mess anything up or plug something in the wrong place. We were extremely cautious with static electricity and of course I double and triple checked every connection via the manuals. 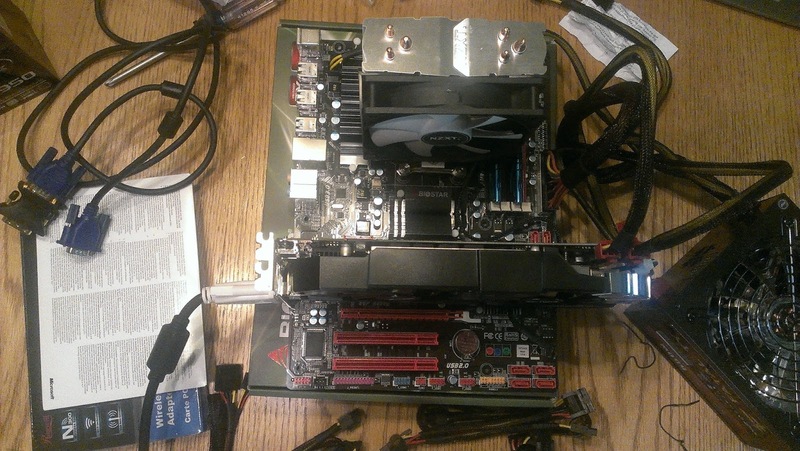 After installing the CPU, CPU Cooler, RAM, power supply and graphics cards, we went to try a "test boot". When I went to plug in the monitor I realized it had the wrong plug (VGA not DVI). Well, of course it was wrong. Off I go to get a new one, hoping that it's a $4.00 part. I stopped at North American Computer in downtown Waukesha. I explain my dilemma and show him a picture of the connector I need. The clerk checks and it turns out he doesn't have any in stock. Well, of course he's out of stock. Off I go to Radio Shack to get my still hoped for $4.00 connector. Radio Shack has one thankfully but it's $16.00. Well, of course it's four times what I was hoping. I buy it anyway because I have a computer carcass sitting on my dining room table and a teenager waiting to see if our Frankenstein has any life in him. At this point it looks like this. Bear in mind that what you're looking at there is a $700+ computer. Or really a computer fetus at this point. Or maybe an embryo. I get the plug hooked up to the monitor and plug the monitor in and we come to the moment of truth. We "short" the power switch to see if she powers up. Sure enough all the fans start whirring and looking healthy. The only thing missing was a failed boot message on the monitor. Well, of course there's no failed boot message. After retesting the monitor cord, all connections, RAM configurations and then resorting to some heavy duty praying, we had no luck. I take it in to North American Computer on Monday and tell them what happened. They said they could run diagnostics on it, but it sounded like a fried motherboard to them. The diagnostic charge was $25.00 and they would apply that to the build if we wanted them to build it. Well, of course it's a fried motherboard and of course it's $25. I send it back to New Egg for a replacement and I send the CPU Cooler back as well, which the guys at NAC told me was an unnecessary (and cheap) part. I fill out a 37 field online form for New Egg and package it all up for what I hope is a $5.00 shipping charge. I take it to UPS and it turns out to be $16.00 to ship. (Not to mention a $4.00 restocking fee on the $16 CPU cooler). Well, of course the shipping is 3 times what I'd hoped. Three weeks later the new motherboard arrives. At this point I just want the PC to work. I know that I am done with futzing with it. I don't have enough confidence or desire to replace anything other than RAM or a hard drive in a computer, that much I've learned through this whole process. So, when Ben asks if I can help him try a "test boot" on it, I say no way. I'm going to take this to NAC and let the professionals build it. While we're there they ask if he or I wants to help. I say no thanks, but Ben hesitated. I could see he wanted to be part of his investment. We left with the understanding that they would build it. That night Ben couldn't rest, and finally asked if he could call them and ask if he could watch or help. He emailed them and told them he'd be down after school. The next thing I know he texts me and said it was done. I drive down there and when I go in I ask the guy how it went, he said Ben had put most of the thing together himself. A couple of emotions came over me. First of all, I felt like a bit of a failure for having given up so quickly. With a little time and patience we might have gotten it together as a team. Or maybe not. The other emotion I felt was pride. I was proud that Ben had taken it upon himself to email the shop and express his interest in helping build. I was also proud that he had done it and learned a lot along the way. I was proud he stuck it out, persevered and finished what he started. It then occurred to me that his "model car hobby" was my "PC build hobby". It was nothing against either of us, it was just that was not our particular interest at the time. I now better understand his Modus Operandi and I think he understands mine. I think the whole ordeal might have even brought us a little closer.